Why is a Water Flosser Important? In our opinion, the Aquarius sets the gold standard as the overall best water flosser. 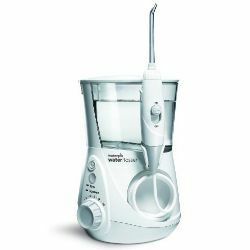 The Waterpik Aquarius water flosser features a refreshing and thorough oral cleaning system which combines 10 levels of water pressure with pulsations to provide effective cleaning in between teeth as well as oral irrigation below the gumline. This is especially important since regular brushing and flossing cannot reach these areas. The design is attractive, compact, and lightweight with a clear LED mode display. A 30-second pacer and a one-minute timer make effective flossing easy. The on/off water control switch is conveniently located on the handle. The Waterpik Aquarius comes with a set of attachments including 3 Classic Jet tips, 1 Toothbrush tip, 1 Plaque Seeker tip, 1 Orthodontic tip, and 1 Pik Pocket tip for complete oral care. Consumers have reported being extremely satisfied with the Waterpik Aquarius because it leaves the mouth feeling fresher and cleaner than traditional brushing and flossing. They also like how easy it is to clean the unit using only white vinegar and water. 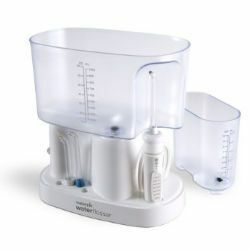 The Waterpik Complete Care system guarantees healthier gums after just 14 days of regular use. Clinical studies have shown that this system is 52% more effective at removing plaque and up to 70% more effective at improving overall gum health compared to the Sonicare Flex. A pulsating stream of water thoroughly cleans between teeth and below the gumline where regular brushing and flossing can’t reach, removing food particles and harmful bacteria. The reservoir can be filled with warm water for sensitive teeth or with mouthwash for an extra-clean feeling. This system is safe for use with periodontal pockets, braces, crowns, and implants. Comes with 2 Classic Jet tips, 1 Plaque Seeker tip, 1 Orthodontic tip and 1 Pik Pocket tip. Consumers have reported being pleased with the range of pulsation modes, making it easy for newer users to get accustomed to using the system and to move up to higher speeds gradually, as well as the pleasurable experience of using this type of water flosser/tooth brushing system as opposed to the traditional method which can be inconvenient and uncomfortable. 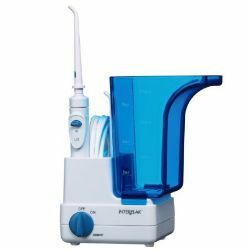 The Hydro Floss Oral Irrigator delivers a flow of gently pulsating water to massage gums and to clean away any food particles or other debris that may be left behind after brushing. This system has been tested and proven to be safe and effective for cleaning around orthodontic appliances, crowns, bridges, etc. IKt is perfect for use to deliver oral medications precisely and can be used with mouthwash as well as water. The Hydro Floss is especially effective at removing plaque and other debris loosened by brushing and prevents bacteria from adhering to teeth. A convenient Pause-Flow button is located on the handle. Consumers report being pleased with the generous size of the system’s reservoir and the no-drip handle. 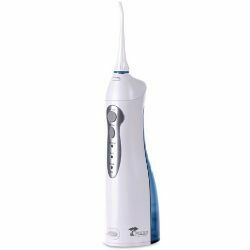 The Waterpik Ultra Water Flosser features an advanced control system which delivers 1,200 water jet pulses per minute providing the gums with a healthy, stimulating massage while alleviating any swelling or soreness. The water jet flosser has been proven in clinical studies to be 93% more effective at removing food particles, plaque, and bacteria from teeth, gums, and below the gumline than regular brushing and flossing. The system delivers significant oral health benefits to diabetics. It features 10 water pressure settings to choose from. The Waterpik Ultra comes with 2 Classic Jet tips, 1 Plaque Seeker tip, 1 Pik Pocket tip, 1 Orthodontic tip, and 1 Toothbrush tip. Consumers report being happy with the compact size and quiet operation of the Waterpik Ultra. 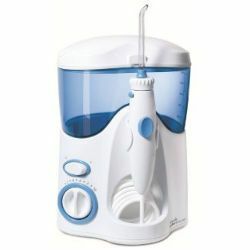 The Waterpik Ultra was formerly the top water flosser until it was replaced by the Aquarius. See the differences between the Ultra and the Aquarius here. The Waterpik Classic Professional Water Flosser comes with a Specialty Reservoir and a unique Pik Pocket tip to provide anti-microbial rinsing. It has been proven in clinical testing to remove up to 99% of plaque as well as being up to 50% more effective at improving overall gum health compared to traditional string flossing. Safe for use on braces, periodontal pockets, crowns, etc. This system comes with 2 Classic jet tips and 1 Pik Pocket tip. Consumers report being pleased with the additional water basin feature and the quiet operation of the system. The Conair Interplak Classic Dental Waterjet features n easy to clean, generous 10 oz. reservoir and a 3-foot hose. The system offers 7 pressure settings and is safe to use on bridgework, orthodontic braces and crowns. 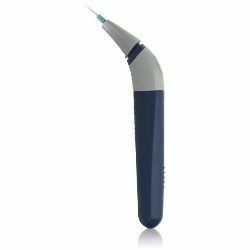 The water jet delivers 2,650 water pulses per minute, providing gentle but thorough cleaning between teeth and below the gumline. Safe for use with mouthwash and antibacterial dental rinse as well as water. The unit is easily disassembled for cleaning. Comes with 5 interchangeable jet tips. Consumers report being pleased with the long life of this product as well as the fact that it contains no external metal arts, eliminating the possibility of rusting. 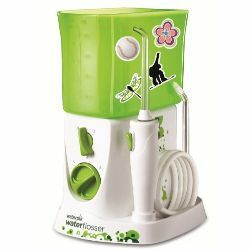 The Waterpik Water Flosser For Kids was created specifically for use by children ages 6-12. It’s fun design is compact and whimsical to engage kids and make oral care fun. The system is designed to be simple to use for smaller hands and mouths. It features 3 pressure settings and is perfect for cleaning braces and other orthodontic fixtures. The massaging action stimulates healthy gum development and circulation. Consumers report being pleased with the smaller size, making it perfect for use in a child’s mouth, as well as the easy operation of the unit, so kids can do it themselves. The ToiletTree Professional Rechargeable Oral Irrigator operates on Lithium Ion batteries, is fully rechargeable, and has a large, easy-to-fill water tank. This fully hand-held design makes complete oral health care easy on the go, any time, anywhere. The tips are easily changed with the touch of the release button. The motor is 68% quieter than previous models. The design makes it easy to reach all areas in the mouth for a thorough flossing and gum-massage action. 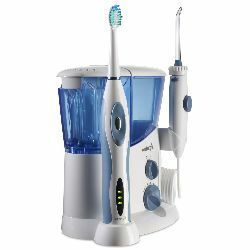 The tank holds 1/2 cup of water, mouthwash, or dental rinse and the unit is as powerful as the plug-in Waterpik models. Consumers report being very satisfied with the convenient toothbrush-like design of this product, making it perfect for travel, as well as it’s sturdy design. 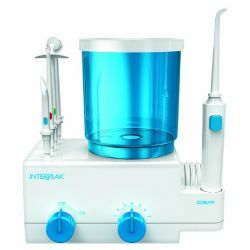 The Jetpik Elite Dental Flosser/Oral Irrigator guarantees cleaner teeth and healthier gums after only one week of use. Clinically tested and proven to remove up to 99% of plaque with 240% more effective results. 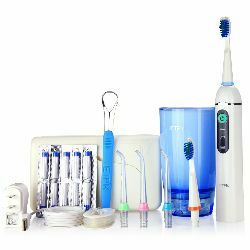 The complete system combines pressurized pulsating water flow and pulsating floss with the action of a sonic toothbrush, all in a portable package. The Jetpik has been proven to be twice as effective as the standard water-jet irrigators. By combining all these features, the Jetpik delivers the benefits of pulsing water irrigation with the cleaning and scrubbing action of dental floss and brushing. Consumers report being very satisfied with the all-inclusive action of this system and the fact that it provides excellent cleaning on every level. The Panasonic Portable Dental Water Flosser features a collapsible dental water flosser design so that it fits conveniently into a travel bag. The high-powered pulse action and two-speed system is perfect for everyday tooth and gum care and excellent oral health. The entire unit is completely waterproof for fast and easy cleaning. The water tank holds 165 ml. of water, mouthwash, or antibacterial dental rinse. It operates on 2 AA batteries, with each battery charge providing 5 to 6 uses. Consumers report being pleased with the unique, collapsible design and powerful performance for a handheld, compact design. 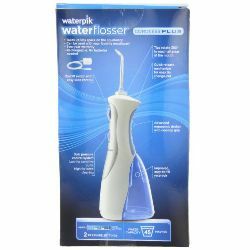 The Waterpik Waterflosser Cordless Plus provides three times more effective cleaning than regular flossing for removal of plaque and food between teeth. It features a dual-pressure water control system for a wide range of cleaning and massage options ranging from gentle to deep. 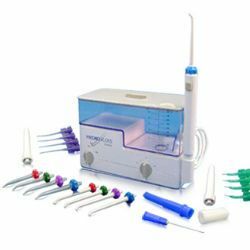 The Waterpik Waterflosser has been shown in laboratory testing to remove as much as 99.9% of plaque and bacteria with only a 3-second use in a targeted area. The unit comes with 4 specialized, interchangeable tips: 2 high-pressure Classic Jet tips, 1 Plaque Seeker tip, and 1 Orthodontic tip. Consumers report being pleased with the longevity of the Waterpik Waterflosser as well as the handy, cordless design and powerful performance. The Conair Interplak Dental Water Jet is conveniently battery-operated, eliminating the need for cumbersome, unsightly cords. The innovative design features a high/low flow control on the handle for easy control. The unit operates on AA batteries. The Conair Interplak improves gum health and overall oral care, even reducing gingivitis and helping to prevent gum disease. It comes with two classic pics. Consumers report being happy with the compact design of this cordless model, which makes it perfect for travel as well as it’s low energy use, resulting in longer battery life. 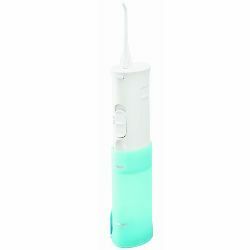 The Waterpik FLA-220 Power Flosser operates on a single AA battery, which is included. It features unique, flexible nylon tips which reach easily between teeth to effectively clean between teeth and gently massage the gums. The unit comes with 15 tips which last for 2-3 weeks of regular use each. Operation is simple thanks to the single-button control. Tips are easily removed and replaced without the usual amount of pulling. Consumers report being happy with the Power Flosser’s comfortable complete cleaning power between teeth and thorough cleaning of braces, crowns, etc. 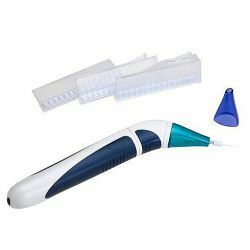 The Waterpik FLW-110 Power Whitening Flosser comes complete with a set of 15 mint-flavored tips which also contain a tooth-whitening agent. Used regularly as part of the flosser system, these tips work not only to clean between the teeth and below the gumline, they work to whiten between the teeth as well. The unit is cordless, operating on a single AA battery (unlike most battery-operated systems, the Waterpik FLW-110 comes complete with a battery). Consumers report being pleased with this unit’s use of only one AA battery as well as the effective stain-fighting compound present in the mint tips. 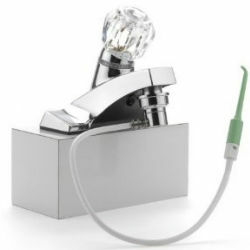 The ShowerBreeze Water Jet Dental Irrigator helps put an end to gum disease, bleeding gums, etc, and eliminates the risk of bacterial growth on teeth and gums. The unit is made of chrome-plated brass for long life and no risk of oxidization. Loose plaque and food particles between teeth will be powered away including below the gum line where regular brushing and flossing are ineffective. The ShowerBreeze Dental Irrigator eliminates tartar before it becomes plaque by washing away the bio-film tartar attaches itself to on it’s way to becoming more firmly attached plaque. The system comes with two tips and a tip holder. The tips are created to spray in a fanning motion rather than in a “needle” stream. Consumers report being pleased with the unique water stream, saying that it delivers a more thorough cleaning and massage than most dental irrigation systems. 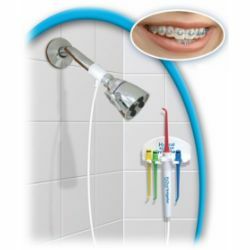 The Waterpik Showerpik Water Flosser uses a specialized combination of pulsating action and water pressure to deliver maximum cleaning between teeth and below the gumline. The system has been shown in laboratory studies to remove up to 99% of plaque from teeth and is up to 50% more effective in promoting healthy gums. 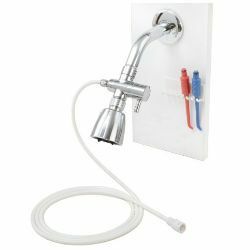 The system installs easily onto an existing wall-mounted showerhead or a hand-held model via a 2-way chrome diverter (included). 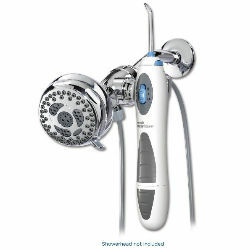 The Showerpik comes complete with a rechargeable battery pack, two Classic Jet tips and a tip cover. Consumers report being pleased with this product due to it’s “all-in-one” convenient installation and use in the shower as well as the dual-pressure control, located on the handle. The QuickBreeze Oral Irrigator attaches to a water faucet easily by replacing the existing faucet aerator with the QuickBreeze faucet adaptor and the diverter valve adapter. The QuickBreeze delivers complete, refreshing, and healthy cleaning and gum-massaging action in just minutes to remove food, bacteria, and plaque from teeth and gums. The strength of the water stream is determined by the strength of the water flow from the faucet. Consumers report being very satisfied with this product due to it’s lifetime warranty and ease of installation and use. The H2Oral Irrigator makes proactive dental care easy by providing exemplary hydro-flossing action and gum massage, all while in the shower. The device attaches to an existing wall-mounted showerhead via the included 2-way diverter attachment and hose. The hose measures a full 2 feet in length, providing the perfect reach for use in the shower. It can also be attached and used with a hand-held showerhead just as easily. Consumers report being very satisfied with this product due to the no-cleanup convenience of using it in the shower as well as the ease of choosing water pressure, temperature, and unlimited water supply since there is no reservoir to run empty and refill. The Profloss 4190 Waterflosser attaches to most any faucet thanks to it’s internal AND external threads. You determine the strength of the water jet pressure and temperature by the faucet setting and the Profloss does the rest, removing bacteria plaque, food, and other foreign matter from between the teeth while power cleaning and massaging the gums at the surface and below the gumline where traditional brushing and flossing are ineffective. Consumers report being pleased with the Profloss due to he fact that it requires no electricity or battery power, and because it provides a stimulating cleaning experience, leaving the mouth revived and refreshed. We all brush our teeth, some more than twice on a daily. However, are our teeth really clean? Does brushing alone get rid of oral debris? Well, the answer to both questions is no. The job is not completely done by merely brushing the teeth. Regardless of the toothbrush size, the bristles will always be too large to fit between the teeth or under the gumline. Of course, this is where many of the food particles get stuck. The only way to get rid of a few more of those particles is by flossing. Ease of use: Water flossers are quite easy to use. Point the nozzle between your teeth and on the gumline and start cleaning. Let the water wash away any food particles and bacteria. Effectiveness: Due to the pressure and the ease with which the water passes between the teeth, debris is washed away. This makes water flossers quite effective in maintaining oral health. Efficient oral health: Water flossing takes only a short time — about a minute or two — and is clinically proven to be more effective than string flossing. This means you can water floss without affecting your schedule. 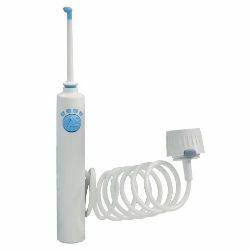 Perfect for sensitive teeth: Waterpik Water flossers do not agitate the teeth. They are gentle on both the teeth and the gums and prevents bleeding gums. Works well with braces: If you wear braces, an oral irrigator is a must-have device in your dental health arsenal. Water flossers can wash around the braces thus removing any debris around the braces. Get rid of gingivitis: Unlike the best brushes and string floss, water flossers are capable of effectively removing bacteria that are lodged between the teeth and the gums, as well as under the gumline. This assists in reduction of gum disease.